They show up before Thanksgiving and stay well into the new year. They can be found in homes, offices, schools and on display in just about every retail location. 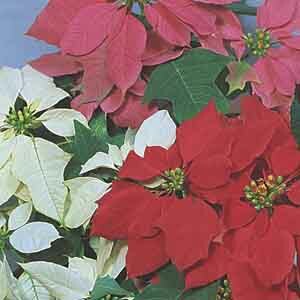 We’re talking about poinsettias of course! These days the holidays just aren’t complete without them! Though often exhibited in snowy scenes, the poinsettia is native to Mexico and grows naturally as a shrub or small tree in the forests of both tropical and dry regions. As far back as the 14th century, the Aztecs cultivated poinsettias for medicinal use, but the plant's association with Christmas didn't begin until the 1500s. Legend has it that an angel appeared to a Mexican girl too poor to have a gift for the Christmas altar and told her to offer weeds from the side of the road. The girl did, and they bloomed red, thus becoming the first Christmas poinsettias. The poinsettias found everywhere at holiday time are brought to bloom by specialized commercial growers who use a combination of grafting, treatments of a beneficial microorganism and strict lighting conditions. Once home, though, the poinsettia couldn't be an easier houseplant to care for. Just make sure it has sun, and its soil is kept slightly moist, and it should last, in bloom, for up to two months. Poinsettias will even thrive in pots outdoors if the temperature doesn't fall below freezing. Those in warmer climes, USDA zones 11 and 12, can try transferring the poinsettias to the garden, but to bring them to bloom again requires 12 hours of complete darkness a night for 10 weeks. Poinsettias are a member of the genus Euphorbia, also known as spurges, the largest flowering plant family with over 2,000 members representing everything from delicate annuals and heat-loving succulents to exotic shrubs and full-grown trees. Many of the more popular and unique Euphorbias are native to Africa and mimic the characteristics (and are often confused with) cacti from the Americas. One example is the so-called Crown of Thorns, a succulent climbing shrub often sold as a house or container plant. The plant is heat and drought tolerant, a great starter project for those new to houseplants. It can also be kept outside in containers in the summer months and the garden year-round in zones 11 and 12. A similar Euphorbia, regarding ease of care, is the unusual coral cactus. Though not a cactus at all, it nonetheless thrives on rocky soils and little water, making it ideal for a low-maintenance houseplant. The Euphorbia family also offers hundreds of garden spurges, many of which can grow outside in up to zone 4, are heat and drought resistant, repel deer and other herbivores, and add consistent color to the garden. Spurge ‘Fireglow’, wood spurge and cushion spurges are just a few examples of these hardy garden perennials. Poinsettias mean Christmas, no doubt about it, but consider the rest of the Euphorbia family year-round for low-maintenance houseplants and resilient color for the garden. Christmas is that wonderful time of year to spread cheer and fill your home with seasonal décor. Check out some of our favorite decorating ideas and kick-start your imagination!